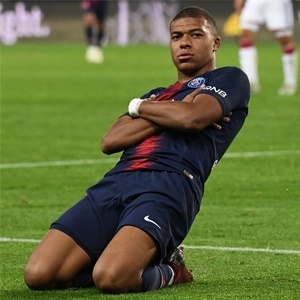 Paris - Football legend Pele told Kylian Mbappe on Tuesday that he believes the French World Cup winner can emulate his own achievement of scoring 1 000 career goals. The 78-year-old Brazilian claims to have netted over 1 000 goals in his career, while Mbappe has so far managed 103 in total. "It's possible, I scored exactly 1 025, so 1 000 goals is possible for him," Pele told AFP in Paris, where he met Mbappe at an event sponsored by Hublot. "I think that even if we count the goals on inter-city pitches and goals on the PlayStation, I won't be able to reach the 1 000-goal mark," said the 20-year-old Paris Saint-Germain forward.